Joanna and her Amazing Technicolor Interwebs: WDW Trip Report - Day 3 - Let's Make a Video! I still think those of you who actually followed us on Twitter have a better idea of the fun we had. We really enjoyed messing with each other via Twitter too. There's a pic out there of him "not" sitting by me on the bus followed by him tweeting a pic of my feet in the seat across from me. Anyways, we definitely enjoyed Twitter while we were there. Once we bussed & Monorailed our way to Epcot, we decided to enjoy Futureworld. That morning we enjoyed Soarin', The Seas with Nemo & Friends, Turtle Talk with Crush, Living with the Land, Test Track, and Captain EO (starring Michael Jackson). Kyle had never done Turtle Talk with Crush, and while we were quite possibly the only people without children there, it was still really cute and hilarious. Captain EO was the original show brought back from the 80s where MJ defeats evil using song and dance. It was good, but it's not making it to my must-do list. Did we do Mission Space? I can't recall... we really got a lot in this day! 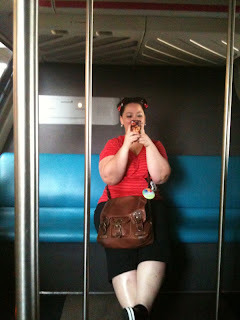 This day the crowds were not bad at all, so we left Epcot by boat to head to Downtown Disney for lunch. We enjoyed sandwiches from Earl of Sandwich at a table by the water. After being sick the day before, I was super happy to be able to eat my sandwich, the Italian. Can't recall which one Kyle got. I should have taken notes. I bought a custom Rice Krispie Treat at Goofy's Candy Company, and I brought it back to the room, but sadly I was never able to stomach eating it. :-( Oh the irony - right now I could really go for one! describe what it tastes like because I've never been brave enough to try it. If you listen closely around 0:50 I completely miss the bottom of the escalator & scream as I trip. I wish I'd filmed a bit longer after that because my nonstop giggling was pretty funny I'm sure. A note about filming: As you can tell, the first day of filming was short, and it wasn't until thenext evening that I really figured out some good times to pull out the camera. Keep in mind that this is my first video camera, and we just filmed for the pure fun of it. The camera we're using is a Sony Bloggie Touch which films in HD. You'll notice I don't film on rides. Perhaps it's me being selfish (you miss a lot when you film), but it's also me being scared of dropping the camera, and my camera doesn't film well in the dark. I think we rode Living with the Land twice that day. It's just so peaceful and relaxing. That afternoon we finally made our way to World Showcase and rode the Three Caballeros attraction in Mexico. It's one of my favorite rides and one I can't help but sing along in. 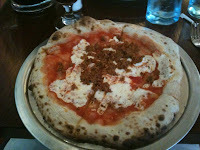 Dinner was at Via Napoli in Italy. 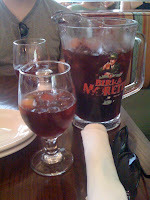 I got the classic Margherita pizza, Kyle got the Piccante Pizza (with sausage on it), and we shared a pitcher of Sangria ($8/glass or $18/pitcher, pitcher made sense). I've read that they use special water to make the pizza dough, and that makes all the difference. Whatever they do, it's amazing pizza! The dough was perfect, not too heavy, not to light. The ingredients were pure and flavorful. I was surprised that the sauce wasn't full of the spices we're used to in the US. It was very light tomato. The service here was also outstanding, in fact, one might argue they were a little too attentive. The second we took a sip of water, our glasses were being filled again, and the waiter continued to pour Sangria into our glasses! I tried to drink a little less and let Kyle polish off more of the Sangria that night since the drinks from the night before had left me super giggly, and we still had a lot of walking to do this evening. At some point I went tweet-silent because I was having so much fun. We ended up in Mexico right by the railing next to the Ring Carver (across from the Margarita Stand) to watch the nighttime fireworks show, IllumiNations. Turned out we were right in front of a fireworks launcher! Made us jump the first time it went off. The location was pretty much a perfect view, so much better than last time. We could see all the countries light up (totally gave me chills) and had a spectacular view of the fireworks. Afterwards we waited for the crowds to clear and went to MouseGears to shop. I've never been one to close down the park, but we really pushed it that night. We were some of the last people to make our purchases, but it was nice to not have to wait in a long line for the bus. Our bus was actually waiting for us when we got there, and it was one of the last of the night. 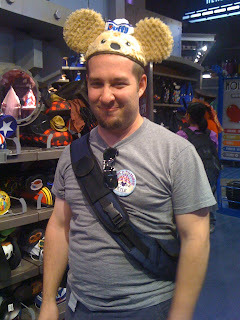 While in the store, I begged Kyle to try on a pair of Duffy Ears for me to tweet a pic. He hates this photo, but it's one of my favorites of the trip. Let me explain why (and maybe he won't unfriend me). It shows his attitude the entire trip: willing to try anything, sweet enough to be uncomfortable for a minute for a photo, and willing to look a little silly to make me smile. This is the dear friend I chose to go to Walt Disney World, and this is why I chose to go with him. He's just awesome like that. This is also why I miss him so much right now and why I cried when I had to say goodbye. It had nothing to do with leaving Disney World and everything to do with leaving a friend like Kyle to be completely across the country from each other. That's just kinda rough. Ok sweet and cheesy sentimental-ness aside, our Epcot day was pretty rockin'! We only really made it through Futureworld, but we knew we'd head back over to World Showcase another day. Getting in so much even when we left the park for lunch was a pretty amazing feat. We ended the night by swimming in the quiet pool by our building. It was stinkin' cold too! Kyle likes to sit on the bottom of the pool when he "swims". I, however, ended up clinging to the side of the pool, huddled in a ball, telling him I wasn't cold. I'd so wanted to swim, so I was like a little kid and didn't want to leave as soon as we got there! He didn't have his glasses or contacts, but apparently my teeth chattering gave me away, and we left the pool after half an hour or so. I know I've muddled up details up the day, so maybe Kyle can guest blog in the comments and set things a little straighter. :) He sure helped flesh things out yesterday, so if you didn't read the comments, go back and do so. Next Post: Kyle and I are already halfway through with our trip, but the videos only get better (and more frequent) from here! 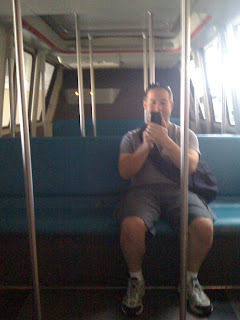 Day 4 Kyle and I headed to Animal Kingdom, Boma, Downtown Disney, and D-Street. Come back soon to see how much fun we had! Great trip report so far! Looks and sounds like it was a really fun trip! Thanks, John! I still can't believe how fast it went and how amazing the entire trip was! Total success!